The stark beauty of the Flinders Ranges in South Australia distracts the casual visitor from the realities of its harsh and unforgiving climate. The landscape can be a scorching inferno in summer, while winter can bring tempestuous rain - or none at all. Such extremes of weather made life difficult for early European settlers, and none more than the farmers. The town of Dawson was surveyed in 1881, not far from the now abandoned railway settlement of Ucolta and a few miles further from the major centre of Peterborough. 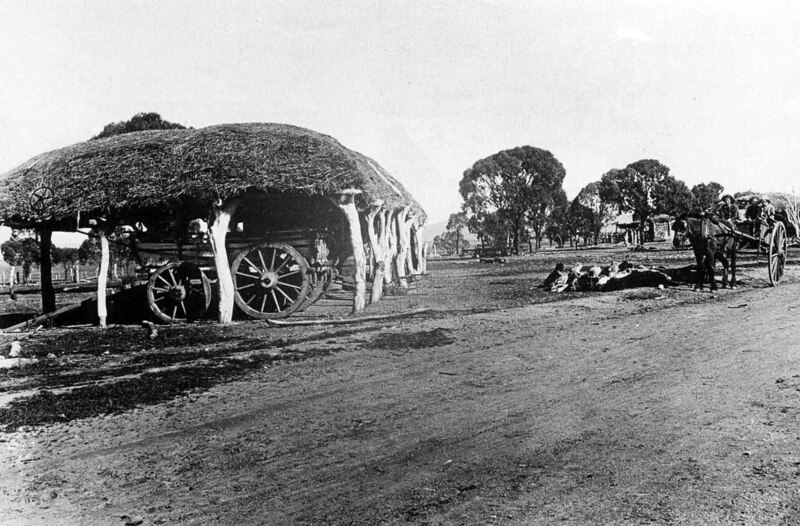 Optimistic settlers took up parcels of land for wheat farming at Dawson (then called Coglin) despite being north of Goyder's Line. 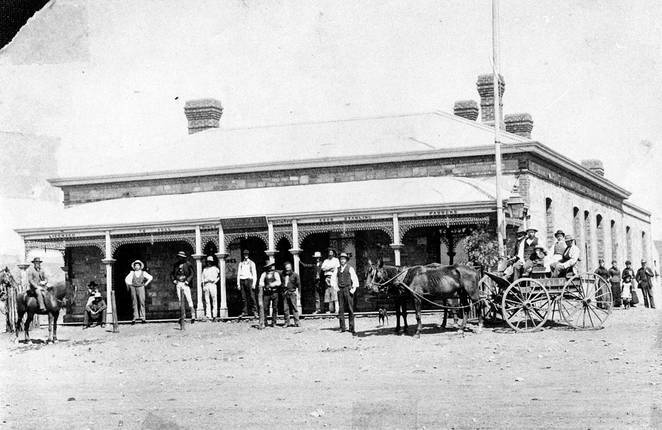 The Dawson Hotel was built in 1882, and God-fearing people who saw worship as of the highest priority soon built Primitive Methodist, Anglican and Catholic churches too. A school, post office, shops and Institute all followed. Some of those buildings still stand today including the state heritage listed Our Lady of Mount Carmel Catholic church. 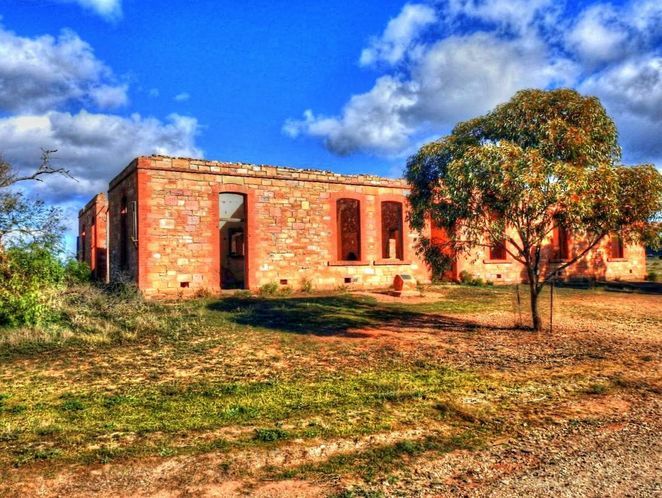 However, Dawson has long been a ghost town, surrounded by other silent and long abandoned ghost towns in the Flinders Ranges of South Australia. Like other towns in the area, Dawson had its good and bad years for farming. Most were not good, but in 1894 news that gold had been found nearby brought great excitement. In 1899 a newspaper reported that "our gold mines are now commanding considerable attention, and a trip around some of our reefs shows that a large number of men are at work". There were brighter times in the town, and one high point was when Queen Victoria's Diamond Jubilee was celebrated in 1897. Sport was a key part of life in Dawson and football games were often played against Ucolta and surrounding towns. Historical records say little about the impact of World War 1, although a teacher who went to war wrote to his class as he sailed to Europe. As World War 2 neared its end in 1945, residents of the town celebrated with a Red Cross dance in the Dawson Hall. The Ugly Man competition was "very evenly contested", and the winner was presented with a bouquet, "artistically arranged in carrots and turnips". But the writing was on the wall for Dawson as early as 1949, when it was suggested that all unsold allotments be purchased by the government. By 1960 this had been accomplished and the town was diminished. The post office which opened in 1881 closed in 1971. The Broken Hill railway line bypassed Dawson and it is some distance from the Barrier Highway. Only determined visitors can see this ghost town in South Australia's mid-north, with its derelict hotel and abandoned churches. My attempt to see the ghost town was almost thwarted by a rogue kangaroo, but both car and kangaroo were able to part ways and successfully continued their journeys. It was eerily quiet as I opened the gate to enter Dawson Primitive Methodist churchyard. The front door was open and I looked inside, confronting its dusty interior. The interior appeared structurally sound and is used for storing building materials, perhaps the remains of another derelict structure. AT the top of a hill nearby, the state heritage listed Our Lady of Mt Carmel Catholic church at Dawson had fared better. Its doors were locked but as I walked around it, I reflected that it had stood the passage of time well over its 130 years. 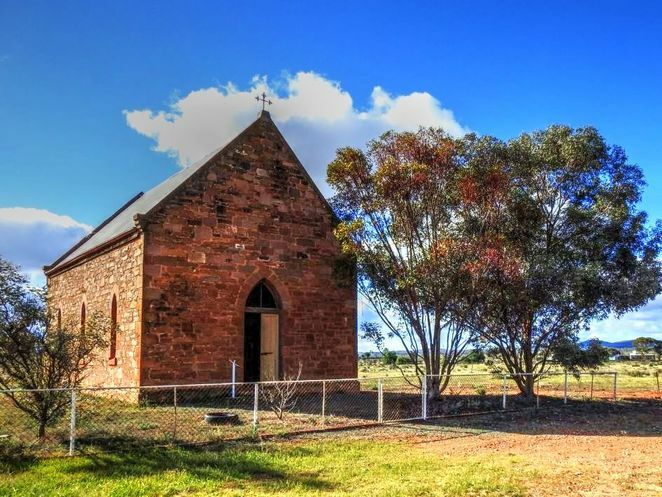 The heritage listing states: "With extreme optimism, small farming communities were established far north of Goyder's Line of Rainfall and hamlets developed. 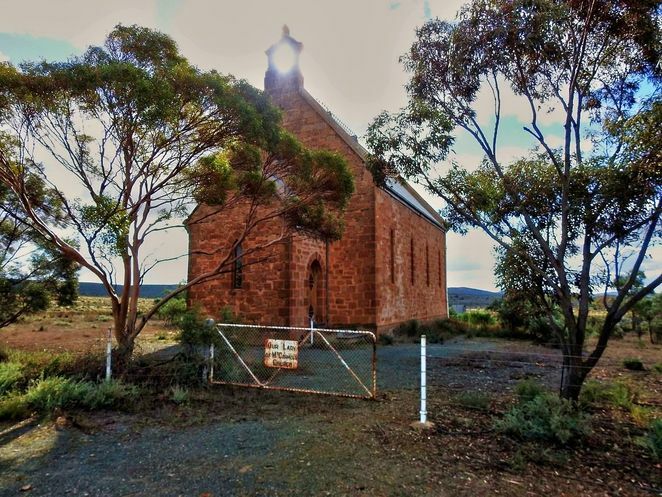 In Dawson, this fine church was built, anticipating a thriving community...Dawson's church evokes all of this history and stands in this barren landscape as a monument to failure". My last stop was at the Dawson Hotel. This once busy and thriving community hub still stands, but without a roof or floor. It is the ultimate pub with no beer. A plaque at the front of the hotel ends with the plea "Please help us protect our heritage". Many thanks to Jeff Noble for permission to use images from the Lionel Noble Collection. Another very interesting article - thanks Dave. I'd love to get out there with a camera. Very interesting, Dave. 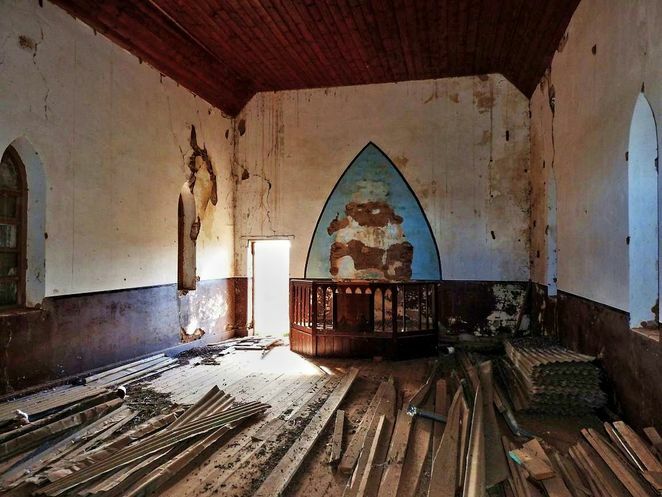 So many little abandoned places out there that had to give up the struggle to survive. Thanks Dave I lived in Peterborough in 1955 to 1965 and remember Dawson its great to see someone writing about these abandoned towns.Its been a few year since Ive been back to visit I remember feeling sad for the town and its brave pioneers . Thanks again Nick .